The knee is an incredible part of the human body. Without having it in place and working to full capacity, it is difficult to do many of the tasks that we tend to take for granted, such as walking to the mailbox or standing for long periods while preparing a meal. This is why so many people gravitate toward knee surgery when the effort of walking or even moving slightly becomes painful or impossible. An increase in your levels of activity and an improved quality of life. range of bending which would be 140 to 150 degrees. Ask your doctor for pre-surgical exercises. If you are having knee surgery, doing exercises to strengthen your upper body will help you cope with crutches or a walker after surgery. Your primary care physician or an internist will conduct a general medical evaluation several weeks before surgery. This examination will assess your health and your risk for anesthesia. The results of this examination should be forwarded to your orthopaedic surgeon, along with a surgical clearance. Shortly before your scheduled surgery, you will probably have an orthopedic examination to review the procedure and answer any last-minute questions. You may need to take several types of tests, including blood tests, a cardiogram, a urine sample and a chest X-ray. Advice your surgeon of any medical conditions you have and of all the medications you are taking. Meniscectomy is official name of the surgery that involves the removal of a portion of the meniscus cartilage from the knee joint. The meniscus is a shock-absorbing wedge of cartilage that sits between the bone ends to provide cushioning and support. Smaller meniscus tears can usually be trimmed to relieve the symptoms of a torn meniscus. A meniscus repair is a surgical procedure done to repair the damaged meniscus. 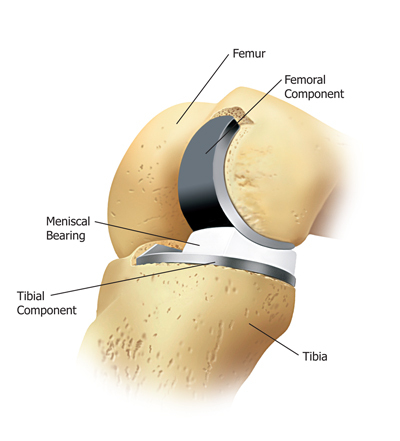 The meniscus repair can restore the normal anatomy of the knee, and has a better long-term prognosis when successful. However, the meniscus repair is a more significant surgery. The recovery is longer, and, because of limited blood supply to the meniscus, it is not always possible. The kneecap moves up and down the end of the thigh bone in a groove of cartilage. The kneecap can be pulled to the outside of this groove, or may even dislocate from the groove, causing pain with bending of the knee joint. A lateral release is performed to loosen the ligaments that pull the kneecap toward the outside of the groove. A plica is a remnant of tissue leftover from fetal development. In early development, your knee was divided into separate compartments. 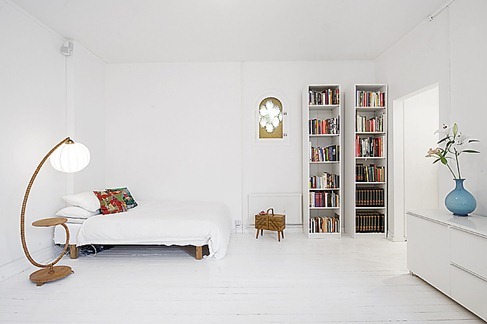 The dividers of the compartments are gradually lost over time, but some remnant remains. When this remnant tissue is more prominent, it is called a plica. When the plica is irritated, it is called plica syndrome. A plica resection is performed to remove this irritated tissue. Meniscus transplantation consists of placing the meniscus from a donor patient into an individual who has had their meniscus removed. The ideal patient for a meniscus transplant is someone who had their meniscus removed, and subsequently begins to develop knee pain. Meniscus transplant is not performed for an acute meniscus tear, rather it is performed when removal of the entire meniscus has caused persistent pain in the knee. The patellar tendon and quadriceps tendon on the front of the knee joint can be injured, causing a loss of strength of leg extension. When the tendon is torn, patients have a difficult time straightening the knee joint. Treatment of a patellar tendon or quadriceps tendon rupture is nearly always a surgical repair. A partial knee replacement is an option for certain types of knee arthritis. When the cartilage loss is limited to a small portion of the knee joint, it may be possible to replace just the worn-out portion of the joint. However, in cases where the arthritis is more widespread, a total knee replacement will need to be performed. When a knee replacement is performed, the bone and cartilage on the end of the thigh bone (femur) and top of the shin bone (tibia) are removed. This is performed using precise instruments to create surfaces that can accommodate the implant perfectly. 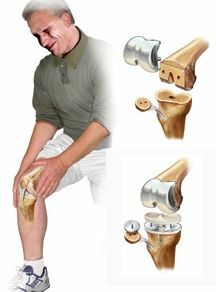 A metal and plastic knee replacement implant is then placed in to function as a new knee joint. Depending on the condition of the cartilage underneath the kneecap, the kneecap surface may also be replaced. The patients who undergo knee surgery will be moved to an inpatient rehab after a few days of the procedure. These patients are usually advised to elevate their leg so that they can recover quickly. In addition to this, ice packs are also used on the area that has been operated. The knee surgery recovery will also involve physical therapy and overall, you can expect to spend two to three months for knee surgery recovery. On the second day of the surgery, you will be asked to get up from the bed and start walking slowly. You will be given a walker with the help of which you will be able to walk. There will be a therapist with you when you start your physical therapy. As long as you are comfortable, you will allowed to put up with as much weight as you can. While you will have to rest during the entire knee surgery recover period, except of course during the physical therapy, you should make sure that you are following your doctor's instructions because following his suggestions will definitely benefit you if you want to recover from the surgery in as little time as possible. Get in touch with your doctor regularly and update him on your condition. If you feel that your knee is not feeling as good as it should then you should go and see your doctor immediately. You will be given a medication after the surgery so as to get relief your knee from the pain. Usually, your doctor will advise you to stop taking the medication if there is no longer any pain on your knee. If you are someone who drives then do not start driving just a week or two after your surgery. Surgery is a common option to repair a number of serious knee injuries, including broken bones, torn cartilage, tendon damage, ligament damage and degenerative arthritis. The prognosis or outcome of knee surgery varies with the individual and the extent of injury. India is one the fastest emerging destinations for medical tourism in Asia, mainly catering for international health travelers. Due to the high costs of Knee surgery in the United States, the waiting lists in the United Kingdom, Australia and Canada and the lack of high tech medical procedures in many third world countries, medical tourism is expected to blossom into a ten billion dollar business world-wide. The doctors have internationally recognized qualifications and training. The country specializes in treatments such as dental cardiology, ophthalmology, oncology, urology, neurosurgery and gynecology. The prices are comparatively low than other countries that provide the same treatments and technology. Indian Hospitals have a good reputation and are well known to cater to foreign patients. India provides low cost health care facility without compromising on quality treatment. 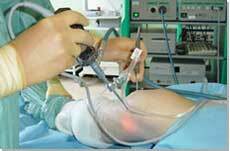 India offers knee surgery at various international hospitals. By getting the surgery done in India you can save up to 80% of the cost that you have to pay in other developed countries. Healthcare services are getting too costly in countries like US, UK and Canada. A lot of waiting period is being imposed on patients for various knee surgery procedures, which in turn becomes very difficult for the patients to acquire healthcare services. Where as like India offers world class health care facilities, zero waiting periods and cost effective knee surgery has attracted tourists all over the world. Tou2india4health Group has an efficient back office support, with a group professional people in Healthcare management, Marketing and Administration. We handle patients all over the globe & recommend them to the best medical establishment. We ensure in giving the best treatment without spending too much money. Benefits of working with us include zero waiting time, complete personal care and cost effective treatments. We have our network Office worldwide, marketing and promoting our associated health care providers. We act as a facilitator between the patients and the hospitals, assisting them right form their arrival, treatment and departure. behind its surging popularity is better healthcare services at an affordable budget. Type characters you see in the picture above.